Hong Kong Korean food is true to its origin. I cannot make this statement if I had never worked in a Korean company for 4 years. During that time, all my bosses were Korean. We attended several company dinners and picnics which gave me many good opportunities to check out the real Korean cuisine. This plate of Korean appetizer is commonly served in all Hong Kong Korean restaurant. Every woman of a Korean family has her own Kim chi recipe. From there, I was able to compare it with my past experiences with Hong Kong Korean food. Stepping into any Hong Kong Korean restaurants, you will never miss the aroma of grilled meat. You can order any kind you like and grill it on the hot plate by yourself or by the staff. Korean prefer beef. There was a time that I doubted if this is truly Korean food until participating in a company picnic. All the Korean brought at least 1-gallon container filled with marinated beef short-rib. Their wives did all the marinating. As soon as we arrived at our destination, they were so effectively and efficiently to set up a fire with few bricks and grill it away with the help of a few pairs of wooden chopsticks. The meat was perfectly done and tender. So, from then onwards, I realized the Hong Kong Korean food is authentic. My favorite Korean restaurant in Hong Kong is Sorabal. Apparently, this is a very well-known restaurant in Korea as well, accordingly to my ex-boss. 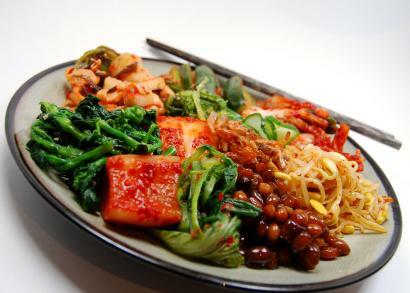 1) "Seasonal Special Korean Vegetable Salad" - Kim chi is a very well-known Korean food. Nothing is better than home-made which I was lucky enough to try that. Korean use kim chi almost in everything. It is not surprising to find out this ingredient in different dishes and its favor infused throughout. 2) "Sauteed Vermicelli with Shredded Mushrooms and Vegetables" - This is another great appetizer. It is served cold. Vermicelli is a popular Chinese noodles. Centuries ago, Chinese culture was widespread in the Asia which eventually affected the cuisine of different Asian countries. Believe it or not, Korean culture is getting more and more popular in Hong Kong in the last decade. It is not surprising to see a Hong Kong TV series originally from Korea. 3) Marinated Short Ribs - Like I mentioned before, grilling is a MUST in Hong Kong Korean restaurants. You can order different kinds of meat, such as pork, chicken, seafood and so forth. In Sorabol, the staff grilled the meat in front of you. But I am so used to my childhood memory of grilling my meat in other Hong Kong Korean restaurants in the past. It was so much fun. So, I was a little disappointed when I first saw them grill our meat. 4) Stone pot rice - It is pretty much another must as a kind of Hong Kong Korean food. By looking at the name, you can easily figure out what it is. The rice and other ingredients served in a pot made with stone. I myself like their "Mixed Stone Pot Rice" which has different vegetables, such as seaweed, bean sprout, shredded carrots, mushrooms and a raw egg. Mixed them all together and serve. There are many varieities and combination of this dish. The pot is very, very hot and takes a while to prepare. So, if you order this dish, be patient in waiting. 5) Ginseng Chicken Soup - Korea produces the best ginseng in the world. This soup used to be regarded as a symbol of wealth in my grandparents' generation. Due to the busy lifestyle of Hong Kong people , it is not cooked as much as it used to be. However, you can definitely find this soup easily on the menu of any Hong Kong Korean restaurant. To westerners, this soup looks very bland. But to Asian, the clearer the soup, the better. It is very flavorful in taste. Dining with Korean, I learned that eating meat is luxury in Korea. In one company dinner, a Korean ordered a dished served with lettuce wraps, pepper (similar to japaneo pepper) and thinly sliced raw pork. When the dish was served, all our mouths dropped open. We may have Japanese raw fish in any Hong Kong Japanese restaurant or raw beef once in a great while. We would never thought of eating raw pork. Being respectful and courteous, my colleagues and I had to help ourselves and finish it all while we were hoping that we would not get sick after. After the dinner, our Korean boss explained to us that if they are able to order this dish in Korea, it makes an extraordinary meal. We somewhat understood where he came from. I believe due to the swine flu, I no longer find any raw pork served in this way any more. Instead, the dish is served with pouched pork. The staff and environment of this Hong Kong Korean restaurant are very nice. They have 2 other branches in other locations in Hong Kong. It is convenient enough if you want to try out some Hong Kong Korean food. Keep your eyes open. There are more Hong Kong Korean restaurants out there. If you are not ready for a Korean meal, Hong Kong food shopping in the supermarkets may be a good start. There are different varieities you can pick. One of my favorite is the Korean instant noodles. For foreigners not very used to Asian culture, like Perry, it could be very confusing. It is because Korean and Japanese food packages look very similar to each other. But don't forget, staffs in the stores are always very helpful. They are always willing to help.